Reprocessing old data can reveal new levels of detail as your processing skill increases. 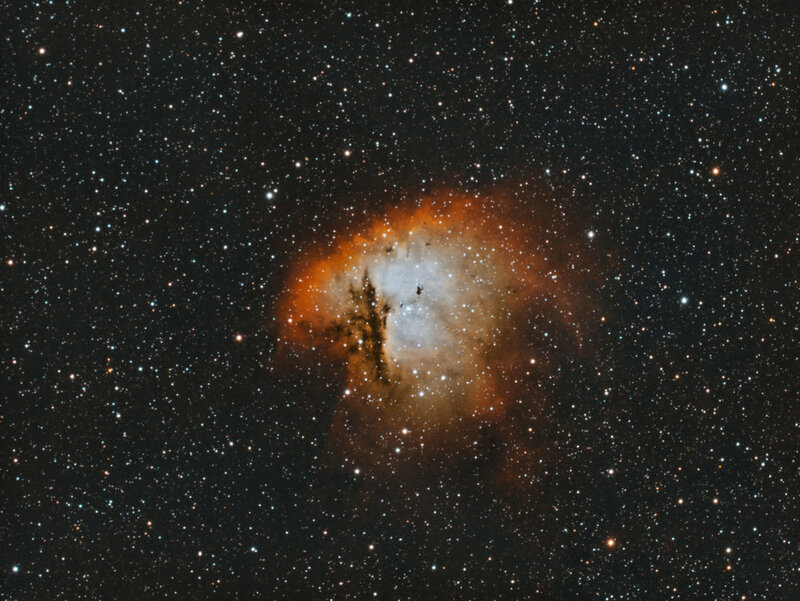 Pacman Nebula captured with EKOS, and processed in PixInsight. I managed to get a few clear nights last week. Just two in fact. So, knowing I had only two nights to image, I focused on getting another bi-color nebula image. My earlier Pacman nebula imaging attempt was at F9 on my RC with a one shot color camera. It didn’t quite come out with the detail I could achieve on this particular image. This one was imaged on my Explore Scientific 102mm FCD-100 scope. I captured about 8 hours per filter (Astrodon 5nm HA, and OIII) using the ZWO ASI1600MM-C camera using the EKOS imaging platform on the Mac. I did the initial image integration and calibration with Astro Pixel Processor, then took each final filter’s image HA and OIII into PixInsight for final processing. In PixInsight, I processed each image to maximize the brightness and contrast of the nebula without destroying the stars. I tried a pixel math combination into RGB with the goal of keeping the nebula as natural looking as possible with good star colors. I find that the following combination is good for that R=HA, G=OIIIx.6+HA*x.4, with B=OIII. I think the final image turned out great. UPDATE: I added some SII data now, for a new pallet based on the Hubble coloring. This new image is a total of 24 hours of data.